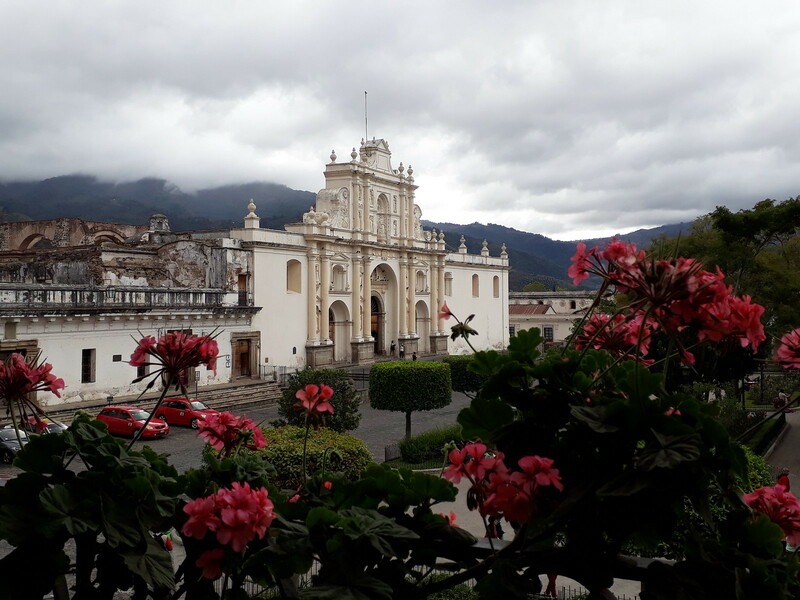 Antigua Guatemala Cathedral from the Palacio (Jan 2019). Guatemala was the first Central American country I visited back in January, which would then proceed the next few countries along the thin strip of land that connects North to South America. Considering my parents had already visited Guatemala a couple of years before, they’d shown me photos of their travels in the country, and I was especially keen to explore it once our cruise ship docked for the day. When it comes to Central America, I had limited knowledge on its geography, history, and its different cultures. Aside from learning about the Maya civilization and Spanish colonization as a kid, I didn’t know much else about the countries in the region. 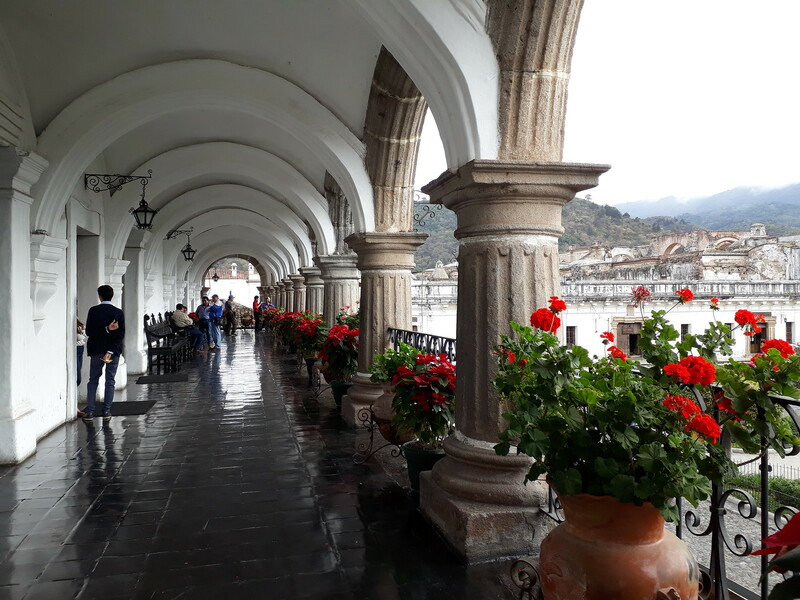 That said, my visit starting with Guatemala introduced me to a part of the world which, aside from backpackers, often gets overlooked as a vacation spot, but lovely all the same. The cruise ship docked in Puerto Quetzal, the major Pacific Ocean port for the country. My family and I had chosen to do the “on-your-own” tour in Antigua for the day, so with that, we took a bus coach with other cruise passengers from the port over. Despite the distance between Puerto Quetzal and Antigua being 81 kilometers (50 miles), the journey time took about 90 minutes due to the limited roads in the country, including many parts which were rather bumpy and/or under construction. Even though it took just as much time getting to and from Antigua as when we visited the town, I didn’t mind it so much since the drive over offered some pretty cool views. As our tour guide said, Guatemala has quite varied terrain, in spite of its small size (about as big as the state of Tennessee). From the lush sugarcane fields to the earthy coffee plantations and finally the volcanic altitudes near Antigua, the changes made for fascinating views on the way over. A common thing I noticed in Guatemala was how many volcanoes there were. They dotted the landscape, and our tour guide told us that many of them remain active today. If that wasn’t enough to scare the average, non-Guatemalan individual, the country also is subjected to heavy rainfall, which can cause mudslides and road closures. As a result, there’s virtually no tourism during the “wet season” (May-October)– fortunately, we went during their “dry season” (November-April), and it wasn’t a problem. We reached the outer gates of Antigua just before 10:00, and from there our guide took us to a tourist shop where it was also our designated meeting point to take the bus coach back to the port. Again, we were given the option of exploring the town “on our own,” as long as we met back up a few hours later to return to the ship. 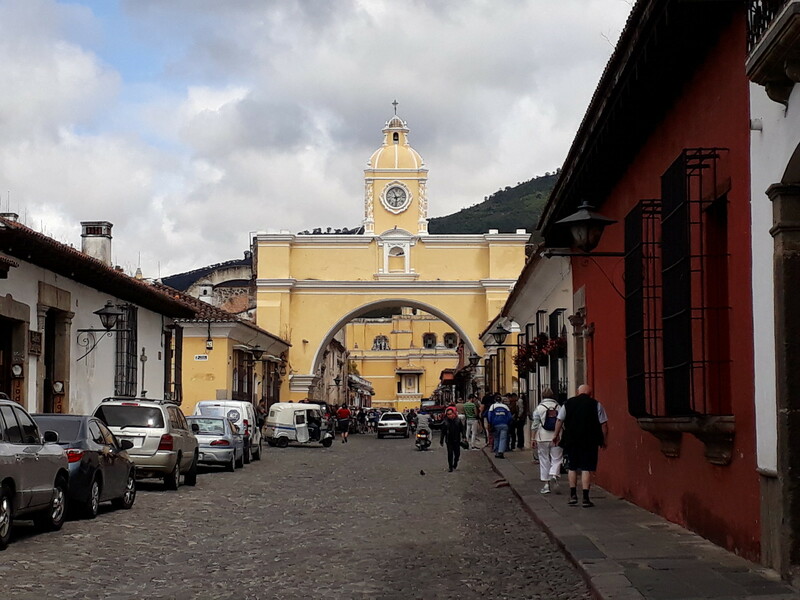 From there, my family and I set off on our own to explore Antigua (also written “La Antigua” or “Antigua Guatemala,” as not to get confused with Antigua and Barbuda in the Caribbeans). It’s not a very big town, as it’s literally ten blocks by ten blocks large all around– it’s also in a grid-like pattern, which makes it virtually impossible to get lost. Since my parents had already visit Antigua just two years prior, they had a working knowledge of getting around. 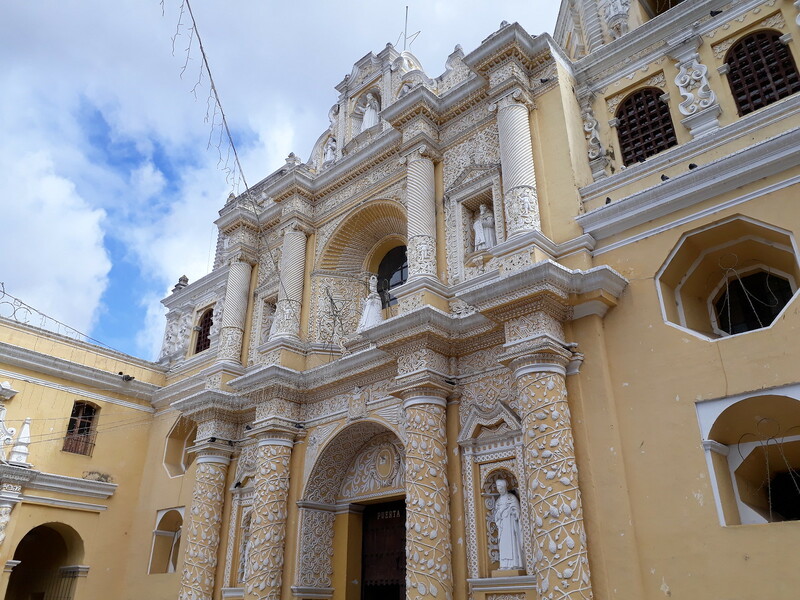 We first headed south to the Iglesia y Convento de las Capuchinas, an 18th-century convent and church. 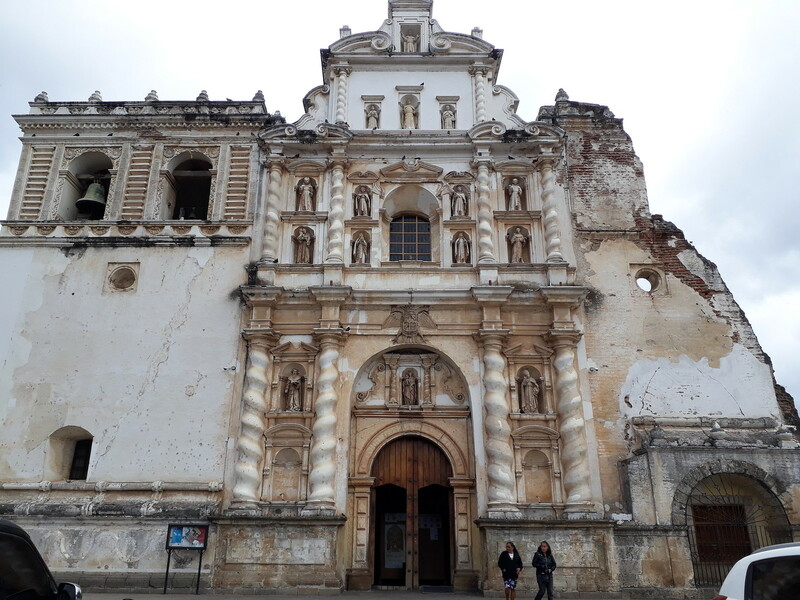 It had suffered a good amount of damage from the earthquakes in the mid-18th century, but its exterior (as well as interior) still remains relatively intact today. 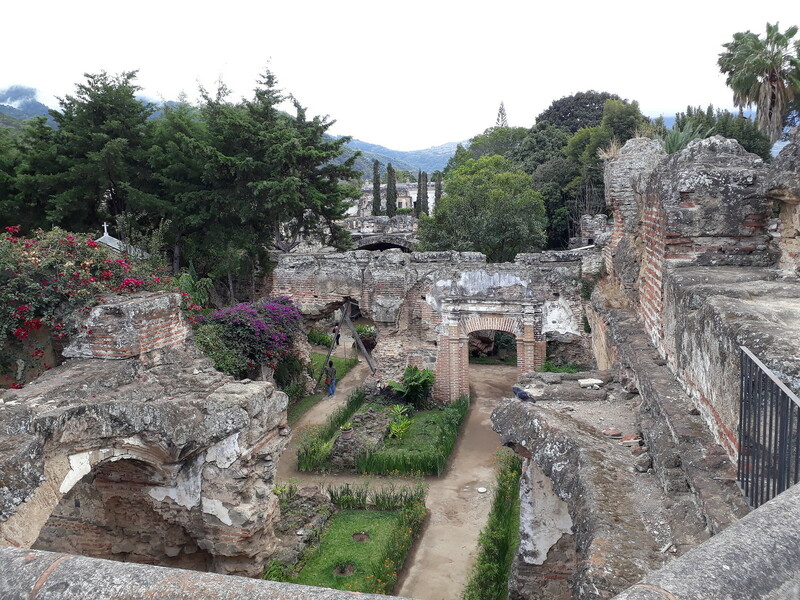 My family and I checked out the nave inside, and I paid 8 quetzales (about $2 USD) to briefly tour the garden ruins adjacent to it. Iglesia y Convento de las Capuchinas. 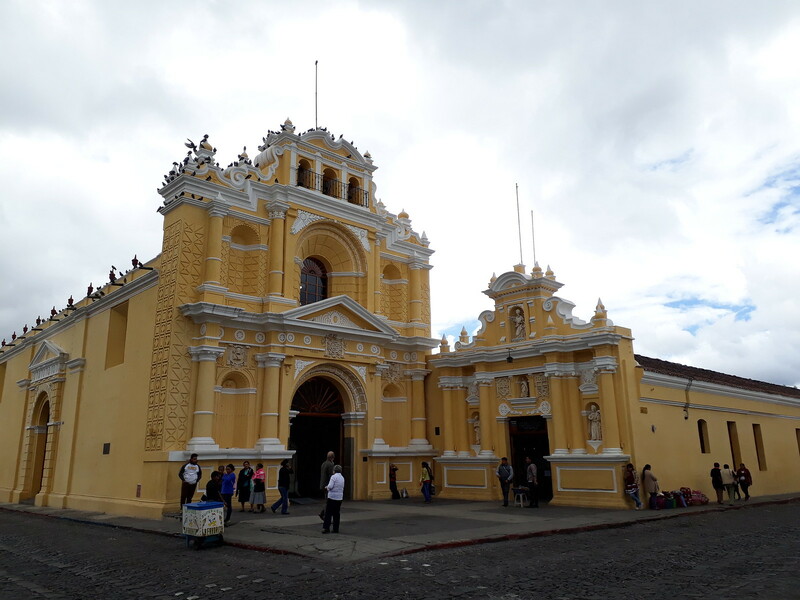 My family and I checked out a few more churches afterwards, including a pastel-yellow Iglesia de San Francisco (which included overarching ruins), the Antigua Guatemala Cathedral, and the Iglesia de la Merced, whose exterior was an intricate white-and-yellow pattern. Of course, they all came from Spanish colonization, which lasted about three centuries from the 16th to the early 19th centuries– while nothing too far off from what one can see in Spain, it’s nevertheless interesting to see the European influences in the Americas. We reached Central Park, the main square in Antigua where everything comes together. There was the Palacio de los Capitanes Generales, a two-story government building upon which we could actually visit and get views of the square from above. A few potted poinsettias were on the terrace, too, which added some color to the photos we took that overcast day. Palacio de los Capitaines Generales. On top of the Palacio. Surprisingly, compared with the intense heat and humidity we’d experienced in Mexico, we found the weather in Antigua much more bearable. For one thing, it’s situated at higher elevation (1500 meters), which naturally made it cooler– the fact that it wasn’t hot made all the difference when it came to enjoying my time there, and I definitely did. From the main square, we headed towards the Arco de Santa Catalina, a notable landmark of the city. Along with the small, colorful buildings on its street, the arch itself is a site that’s popularly photographed by visitors, and of course, I did so as well. Granted, it was no easy feat since it required standing in the middle of the road (where subjected to taxis and trucks), but I managed to snag a couple of decent shots. Unfortunately, it was a foggy day, which obscured the Volcán de Agua in the distance, but the photos turned out well otherwise. 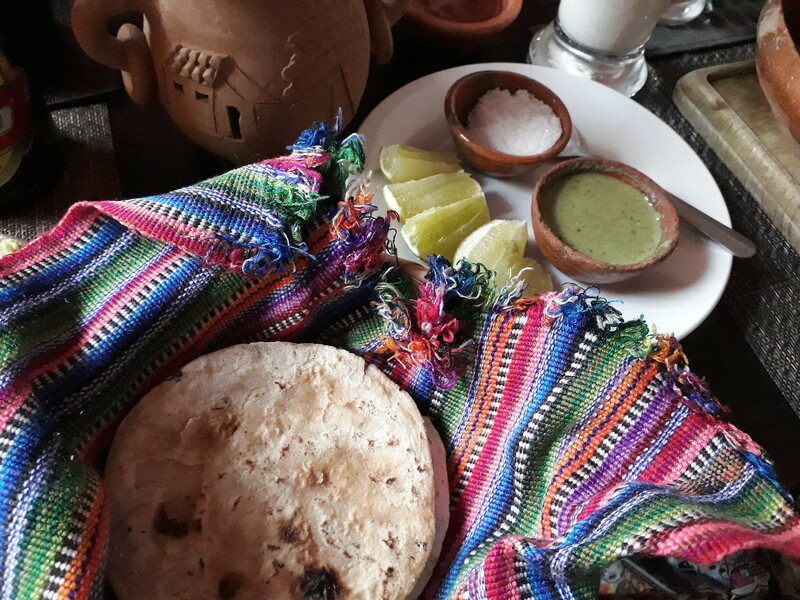 After checking the Iglesia de la Merced, it was nearing lunchtime, so my family and I headed to a restaurant we’d looked up ahead of time for a taste of Guatemalan food. I ordered pepián, which is a classic meat and vegetable stew that had the earthy taste of beans. The portions were pretty generous, and it came with handmade corn tortillas and the spiciest salsa verde I’ve ever had. Along with the Guatemalan beer I ordered, it was plenty of food for lunch. 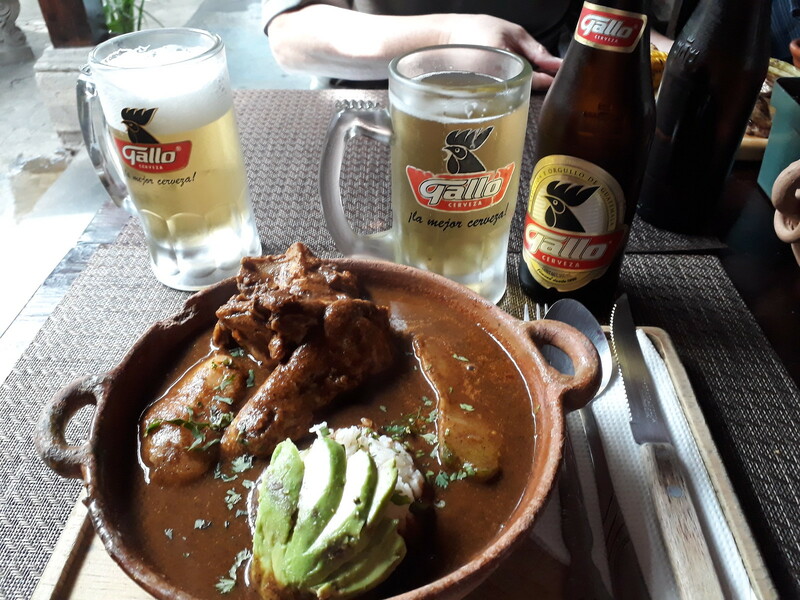 While I wouldn’t say that I love pepián (the chicken was a bit too dry, but I enjoyed the stew itself), I’m happy to have tried a bit of Guatemalan cuisine. Pepián and beer for lunch. Corn tortillas and salsa verde. Following lunch, we wandered around town before popping into the Mercado de Artesanias, a crafts market where locals sold colorful textile items for beautiful souvenirs. 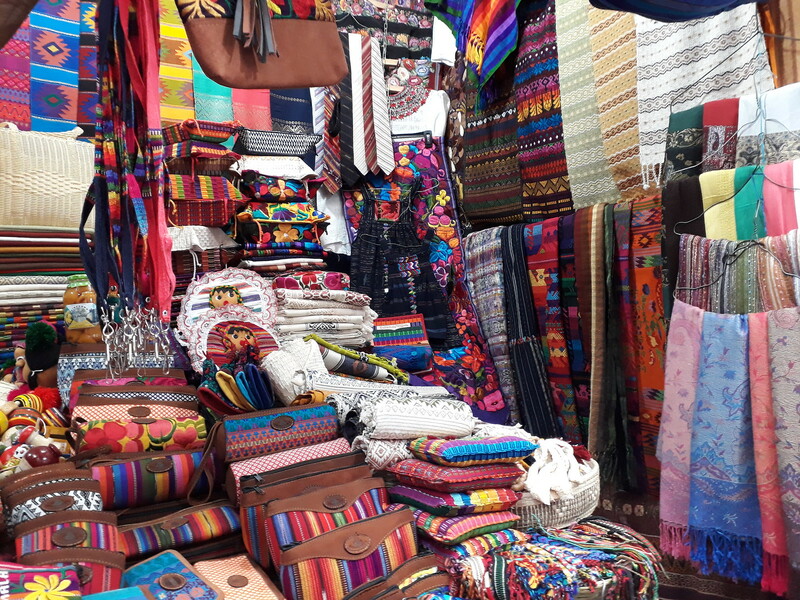 It was a small, rather cramped area, for stalls were literally on top of each other– it reminded me of the artisan markets in Peru, for the atmosphere and items sold were somewhat similar. We bargained for a few brightly-patterned pencil cases and bags, which we then brought home as gifts for family and friends. Our last stop was at café Condesa, a well-reputed coffee shop that sold Guatemalan coffee. The place itself was also something to look at, as its architecture is reminiscent of the Spanish colonial days. 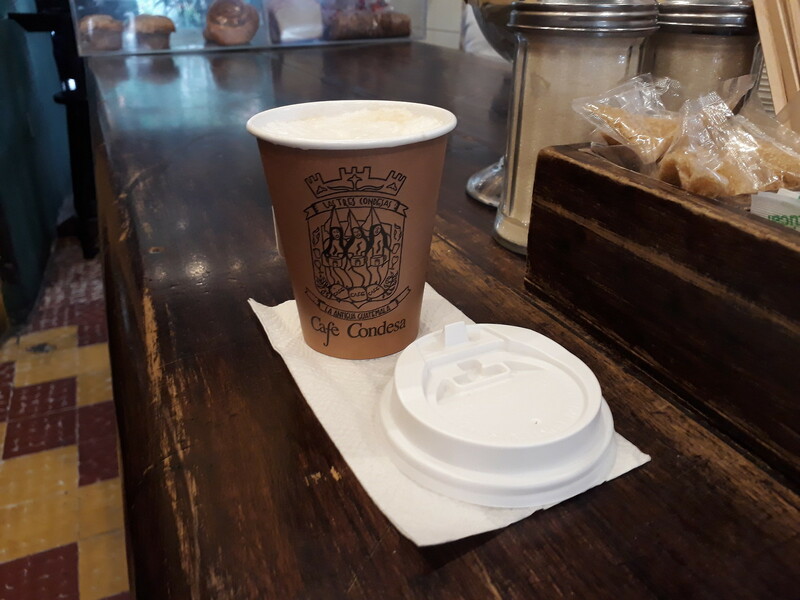 We didn’t have time to sit down, but we were able to buy a cup to-go– I rarely drink coffee, so I didn’t know if there was any distinction in Guatemalan coffee and other ones when I tried it. All the same, it was strong! We concluded our visit of Antigua by 14:00, for we had to catch the bus coach back to Puerto Quetzal. It was a long day of visiting the city, as well as Guatemala itself, but I found it to be one of the highlights of the trip in Central America. 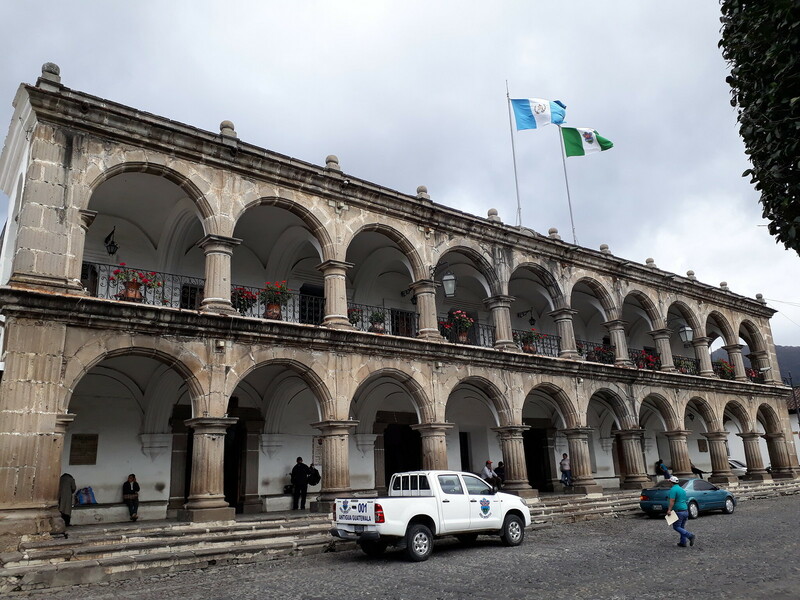 La Antigua itself was a glimpse into the country’s Spanish colonial history, all the while looking lovely– it’s no wonder that it’s a popular destination spot for tourists and backpackers, and it has inspired me to return to see it again, along with visiting the rest of Guatemala, too. More adventures of my time in Central America coming soon! Thanks! Even with limited time, we did mange to see as much as possible! Will be recapping more of my adventures in Central America in the next post! Thanks! Yes, the food was hearty and delicious. Wow Guatemala! Especially loving all the fabrics and colors at the mercado! Definitely! The mercado offered so many beautiful textiles to purchase and take home. Feel free to hit that button, if you're feeling adventurous!